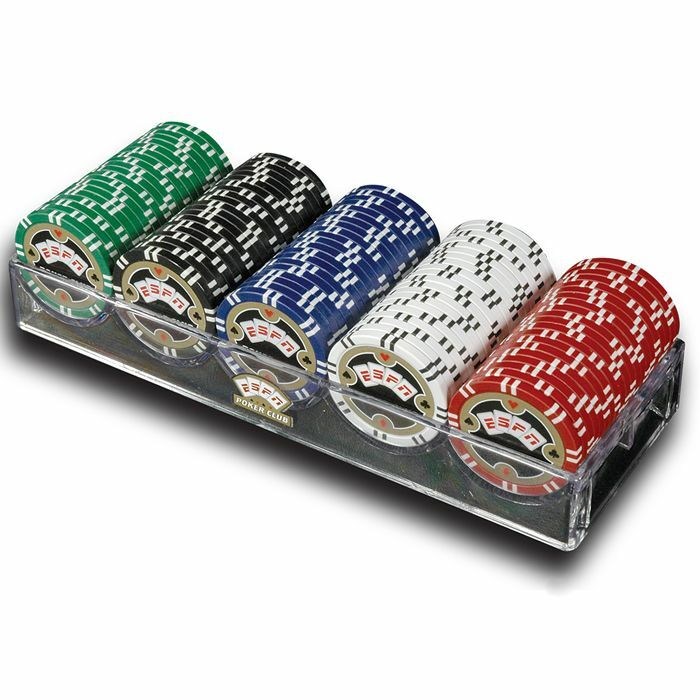 The set includes 100 championship edition 11.5g poker chips in 5 different colors (white, red, blue, green and black) and an acrylic ESPN Chip Rack to hold your chips. And each chip features a custom full-color inlay with ESPN'sR Poker Club logo with a shimmering, gold-colored ring. This graphic is NOT a sticker and will never peel or show any kind of lift from the chip. The graphic is part of the chip! 20 white 20 red 20 green 20 blue 20 black. ESPNR first introduced professional poker tournaments to the mass media in their televised series, "The World Series of Poker." And the poker craze followed soon thereafter, spawning two more highly popular television series and millions of new poker enthusiasts. Now ESPNR has their own line of quality poker products. Endorsed by the "Duchess of Poker" herself, World Series of Poker Winner Annie Duke, these poker sets can be enjoyed by weekend player or poker room regular alike.